I think Thoreau and Walden have the same idea. They both have to do with nature, but they wanted to improve life and make changes. Throreau thinks we need to go through life simply if we let it be, and not realize. Walden thinks that we rely on ourselves, more than anyone and we should. I think the main idea is do your own thing, go your own way. When you finally find a path that goes for you, you will just naturally fall into it. Life can be hard, but don’t be the one who makes it hard. If you live the same life as everyone else you will not be any different. We would all clash. Think about it, do you want a clone of yourself? You’ll have to compete against your clone with everything. We don’t want to go to the same college, same job, same everything as everyone else. Be yourself. If you leave society to live in the woods, you will get cold. Or even heat exhaustion. And as long as you have food, you will be okay. It would be great to be alone in the woods. You can collect yourself and find a true sense of self and who you are. Get away from everyone. Make nature friends. It may be bad because you will get lonely. Being alone can also cause depression and other issues. I don’t think I could do it honestly. I’m too much of a people person. The purpose of independent reading is to practice reading every day. To be able to better your understanding of literature since it is a big part of our world. To better encourage student to read, especially myself, is read things more relatable to us and independently. As far as Independent reading, create something that makes us read more often than the AR system we have. Not gonna lie, we either don’t care enough to do it or we all cheat off each other. Making us do AR logs like Mrs. Callahan does might make us actually read, but do it in a way we read books we can engage in. 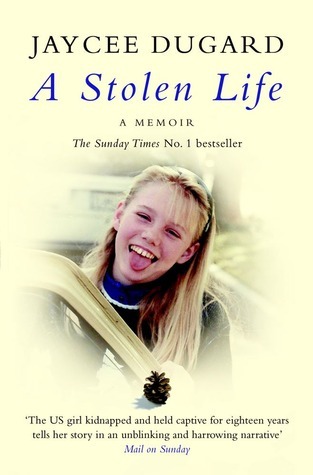 For my first 3rd quarter book I chose a stolen life: a memoir by Jaycee Dugard. This book is about someone who was kidnapped at age 11 and just recently in 2009 was released from the kidnapper after 18 years. I chose this book because for some reason, I am super interested in books about drug addiction, abuse, and just I guess you could call them “horrific” things. It’s not so much that it’s fun and brings joy interesting, rather a I feel bad for them, I want to help these type of people. I started to become interested into this type of books after I read Butterfly Garden a memoir by Chip St. Clair. I’m not sure what is going to happen after the first chapter. So far it was just telling about Jaycee’s life before she moved and now when she moved. The first chapter ended right as she was being kidnapped and kept in a van. What I think is gonna happen is she’s going to be kidnapped for years and years and never be allowed out until she breaks out. My initial reaction wasn’t much of a reaction but a feeling. I felt sorry for the girl having to go through this since she is only 11 years old. The concerns I have for the trailer is what the heck? Why do we have to do it? But also when it is due? Can I not be pictured in it at all? How long does it have to be? What are all of the requirements? Transcendentalism is confusing. I don’t really understand the whole concept. I don’t like it anyways because it is too philosophical for me. I don’t even know if this is an actual word. When I read the excerpts, I did not know what I was reading. Rereading it a second time was no help. I still don’t understand and never learned this is previous english classes. People are naturally evil I feel. If they did not have nature and God then they would just be weird and crazy. Without discipline, kids wouldn’t learn right from wrong. If your family doesn’t care about you as a child you will not follow rules as you get older. Without parents we won’t live a healthy life. We would just be bad people. Because of how we’re raised, we follow laws. For example, we follow the law of no drinking until you’re 21. You can’t drive without a permit or license at the age of 16. Religion and moral beliefs have a great part in this. People believe Adam and Eve are where life started. They ate the apple when they weren’t supposed to. This is an act of evil. People steal, cheat, lie, murder, and etc. Some people go places to help save others, they are social workers, animal doctors, and good people. They are so good, because they are raised right. They start as evil people and are brought up to be better. Think about it, we are in our “terrible twos”, we don’t know anything as a baby, so we naturally act bad and are taught to be good. Another part of transcendentalism is God. People follow religion which is believe by some, and that is what people live by. Society and rules, and God bring us to be who we are as a whole. We go to church and read the bible. He is what started the Bible and why we follow religion.